Our drive west to the ocean is quiet, the road hissing beneath our tires, the drizzle hiding the greater world around us. It is just us, the dashed stripe down the pavement, and the last vestiges of winter along the highway’s edge. Washington is the Evergreen State, and it is always, ever, green; winter or summer, rain or sunshine, something is always green. In this season, it is the cedars, pines, firs, and spruce. They covered the hillsides and the slopes between us and the limits of the grey-misted world: tall, shaggy, dark green sentinels ranked in thick forest ranks, or short, stripling, pale green youngsters rising from the steaming refuse of clear-cut acreage. But not everything is green. Along the roadsides lie ragged clumps of blond, hip-high rye-grass, their slender stalks and dog-eared leaves waving in the wind of our passage. 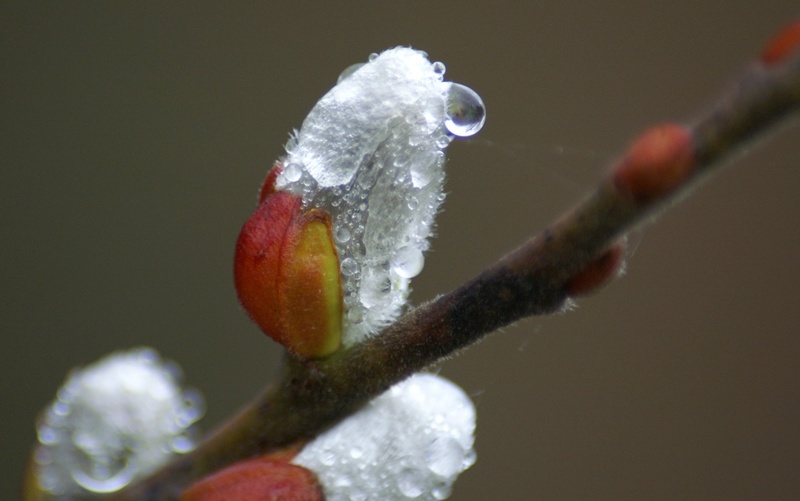 Other trees–maples, birch, oak, and alder–stand naked to the cold, their wet bark blanketed in pale moss or clad in grey lichens, the tips of their branches blushing with the rose and gold of new buds. Beneath them, bracken ferns sleep a little longer, like weekend layabouts, beneath the russet curls of last year’s growth. There are no flowers along the highway shoulder yet, just the dark spreading crowns of sword-leaf ferns and the new shoots of wild barley to tell us that spring is nearly here. When we get to the beach, the serrated salal leaves, sharp as a bread knife, drip with moisture, and the bearded grey buds on the willow twigs gleam with dew. A few frogs creak beneath the dreary day, complaining like old men until my footsteps draw too near. Ducks, northbound travelers, mutter in the marsh that separates me from the surf, while farther off, the pew-pew of plovers mingles with the cat-call of hungry gulls. This is winter’s edge, its bite dulled by spring’s promise, but its grip still firm. For me, this is the beginning. This is my New Year’s Day. This is my season of hope.